Are you still looking for a Perfect Chocolate Chip Cookies recipe? How about using olive oil in the dough? These are wonderfully soft and chewy. No overnight chilling is needed. Everyone has a weakness against chocolate chip cookies as long as they are baked in the right way. I’m not an exception. Plus, I love baking them and trying different type of chocolate chip cookie recipes. I knew the result would be amazing when I placed the baking sheet in the oven. 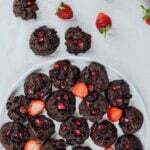 I slightly adapted the recipe from Rebecca’s Dark Chocolate Olive Oil Cookies and would love to thank her from here. Who knew the perfect chocolate chip cookies recipe call for olive oil? These cookies are a big hit for special occasions. I knew I had to try Rebecca’s recipe when I first saw the picture of her cookies on Instagram. Although they looked so good, I must say that it was their name that took my attention first. As an olive oil fan, I loved the idea of using olive oil in a cookie dough and wondered how they would taste. Would they turn out as chewy as soft and chewy as our best chocolate chip cookies? To my surprise, I didn’t feel the taste of olive oil in these cookies. They were no different from regular chocolate chip cookies that are chewy and wonderfully soft on the inside. That’s why they absolutely deserve the name Perfect Chocolate Chip Cookies. This is not a butter-free cookie recipe, olive oil is used for half of the fat and the other half is butter. 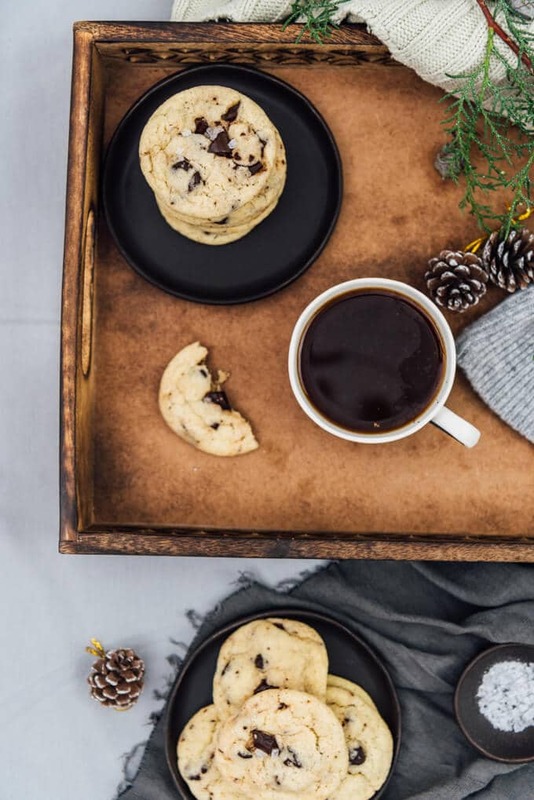 If you are looking for a healthier cookie recipe that is both butter-free and oil-free, check out our Chocolate Chip Yogurt Cookies. You’ll see Greek yogurt makes an incredible substitute for butter. If you are not a fan of olive oil, you can use sunflower seed oil as Rebecca suggests, but the taste is really not noticeable in these cookies. The original recipe calls for brown sugar, but I used granulated white sugar because it was what I had on hand. I’m sure the cookies get even chewier with brown sugar, so you might think of using it in this recipe. Another thing I changed is about the flour. The original recipe requires half all-purpose flour, half bread flour, but I used all-purpose flour only. Rebecca says that the cookies get much chewier and less flat when you use bread flour. I didn’t have any, so I had to go with all-purpose flour, yet I’m quite satisfied with the result. 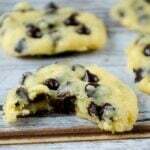 Wonderfully soft and chewy chocolate chip cookies with olive oil and butter combination. Using an electric mixer, cream sugar, butter and oil until fully incorporated. Add the eggs and vanilla extract and mix untl well blended. Add the dry ingredients to the wet mixture and fold just until combined. Add in the chocolate chips and fold until just mixed. Roll into 1 tablespoon-sized balls and place them on the prepared sheet leaving about 2 inches of space. Put it in the freezer and freeze for about 10 minutes before baking so that they don’t get too flat when baked. Bake the cookies for 11 minutes. They will look underdone, but it’s okay. Don’t worry. Let them cool on the baking sheet for 5 minutes and then transfer on a cooling rack until they completely cool down. Thank you Rebecca! Your recipes always inspire me and this one has already become one of our favorites. Great to know that these are healthier than my favorite chocolate chip cookies. They don’t have the olive oil taste at all. I’m sure they would have been even better if I could have chilled them longer before baking. Thanks for the recipe!